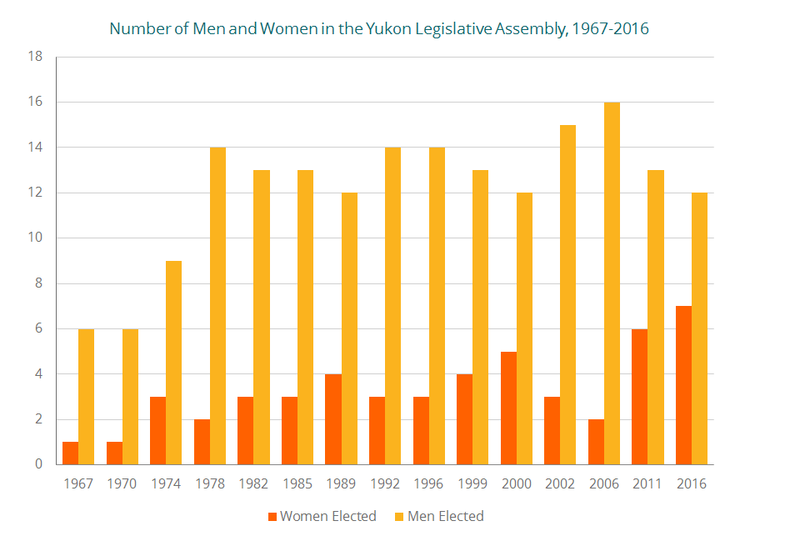 The November 2016 election saw the highest proportion of women elected to the legislative assembly in Yukon history, with women making up 37% of the legislature. The October 2006 election saw the lowest proportion of women elected to the legislative assembly, with women making up 11% of the legislature. There have been many significant events in Yukon women’s history that have affected gender equality. Travel back through the years with our interactive timeline to see where we’ve come from and now, where we’re going. NDP MLA Margaret Commodore (formerly Margaret Joe) of B.C. 's Sto:lo Nation named Minister of Health and Human Resources. Listen to a collection of audio interviews with influential Yukon women and men. These are personal stories of Yukoners sharing their experiences of equality milestones, adding depth and richness to the statistics. The stories emphasize many of the successes, challenges, and changes in Yukon over time and speak to the diversity of voices necessary for a conversation about equality.